How should I pack my item to be sent by a courier company? Wrap each item in the box individually as this will offer better protection of the items whilst in transit. Consider using polystyrene, bubble wrap and foam wrapping for internal packaging to prevent movement in the box. Protect your items by packaging them in a strong inner and outer box. Use strong tape around edges of boxes and packets to seal them securely to prevent damage. Use heavy duty/corrugated cardboard boxes for shipping, ideally a new one. Remember it is your responsibility to reduce the chance of damage in transit, courier networks are huge carrying masses of parcels so be sure to pack it as best you can to reduce the risk of any issues. Don't think that just because your parcel is being sent next day or same day that you don't need any extra packaging. An extra few minutes wrapping and securing your item can save an hour or more sorting out a claim with the protection cover policy that often comes with a delivery order. A comprehensive Parcel Monkey packaging guideline list can be found here. You can also look into our protection cover which acts as cover in case of damage to your item. An important recent issue that has come up has been customers using old boxes, with old labels and stickers on. 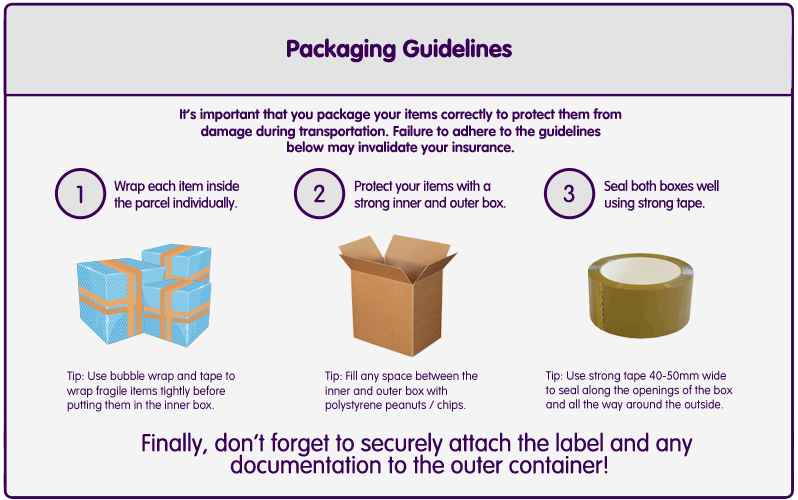 This is no problem as long as the box is still sturdy and not damaged but what can cause the courier's confusion is when in some instances dangerous goods labels are left on boxes, meaning the goods are held or can be sent back. Old address labels or customs documents may mislead drivers or people handling the parcel. Please remove any old documentation, labels or stickers on a reused box to avoid an unwanted headache with your parcel/package delivery. We also have some other useful tips and advice in our FAQ section.